Inventory We are a resale marketplace, not a box office or venue. Ticket prices may exceed face value. This site is not owned by Save Mart Center . Save Mart Center at Fresno State is a multi-purpose arena, on the campus of the California State University, Fresno, located in Fresno, California. An open house was held for community on 5 November 2003 with the official ribbon cutting following on 27 November 2003. Save Mart Center is home to the Fresno State Bulldogs basketball team and, for the first five seasons in the ECHL 2003-08 the Fresno Falcons ice hockey team prior to the opening of the building, the teams played in Selland Arena. 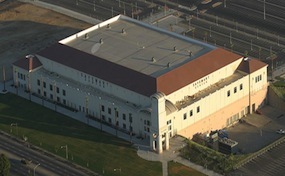 Save Mart Center is also a concert destination with its first concert performance featuring opera tenor Andrea Bocelli. SaveMart.CenterFresno.com is a privately held company that specializes in the sale of tickets in the secondary market. We are not affiliated with any official supplier or box office. To purchase tickets to any Save Mart Center in Fresno events simply call our operators at anytime or click on the event you wish to attend.